Very often we can hear that markets are expensive and that it does not pay off to invest in them. The question is, what kind of markets are we considering and how we compare the expensiveness or the cheapness. In this article, I will show you a few tools that can give us a pretty accurate and final picture of how it really is. 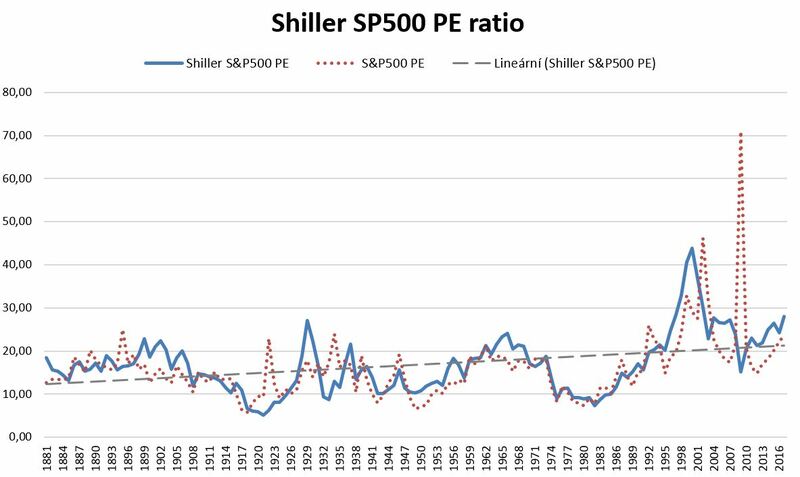 Here I used the classic PE market (red dotted line), together with the Shiller PE, which gives us a PE ratio based on a 10-year average of earnings adjusted for inflation. It is a cyclically adjusted PE indicator. We see that the US market is above the trend line. The current average PE is around 24, the average PE in 70 years is around 17.5, hence the market is expensive. The question is how long it will be expensive. The indicator does not exactly say when the trend turns, as it is with most indicators. 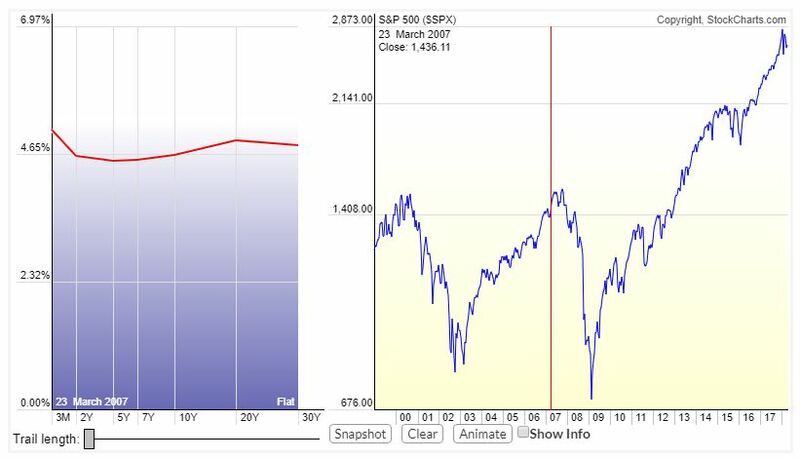 From the chart we can clearly see the year 1929 and the technological bubble from 2000 and the financial crisis 2009, where the normal PE failed and did not show the market’s price, as the Shiller PE. Notice how the pointers are different and how Shiller PE makes it clearer. Source: Wilshire Associates, Wilshire 5000 Full Cap Price Index [WILL5000PRFC], retrieved from FRED, Federal Reserve Bank of St. Louis; https://fred.stlouisfed.org/series/WILL5000PRFC, April 27, 2018. This indicator again does not give the exact point of turnover, but it shows very well how much the market is overbought or oversold. I like the idea of money supply compared to the capitalization of companies. Based on a similar indicator there is a single fund for qualified investors in the Czech Republic, which only operates with the percentage ratio between free cash and ETFs on the S & P500. If we would get rid of the US stock in January 2008, when most of the words were on the top of the list, we would have saved ourselves from losses of 2008 and 2009 (if we would time the market). It is only an additional indicator that can add value to the overall picture of how financial markets are doing. Personally, I have the google homepage set and I can see how the keywords are being developed every day. For crypto fans – look at the search and development of bitcoin or other cryptos and you will find out when was the biggest boom. Again, the drop from the maximum would fit with the search volumes. There is no indicator that can tell you exactly the day or month when the market in a region will fall or recover after the fall. We can only guess at what stage the market is. 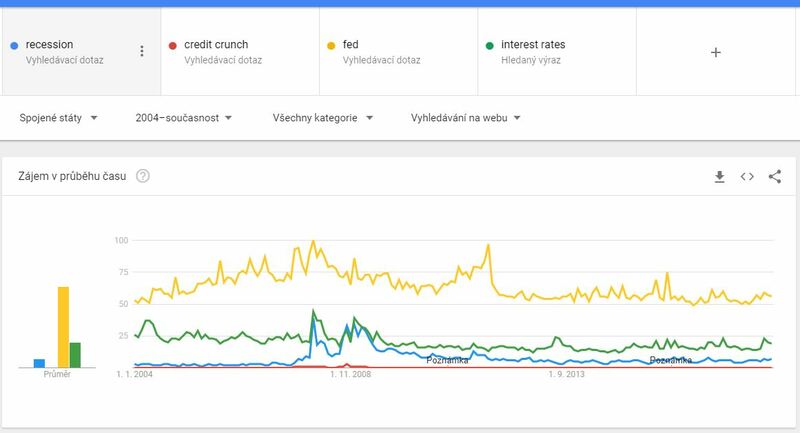 Currently, markets are growing, US markets are overpriced according to by PE, The volume of money in the economy against the market capitalization and market capitalization compare to GDP, but the yield curve and google trends do not suggest that a recession or even a crisis should come in the near future. We are in the bull market, which is growing for the ninth year in the US. But why? Is there growth based on profitable companies or just mindless purchases based on the access to cheap money? Indicators are trying to give you the reply to this question, whether directly or indirectly. It is also good to track debt and pumped money into economies. The ECB slows the program of asset purchases, if the economy develops positively, it will cease completely and slowly raise the rates so that the economy does not overheat itself. Often the growth is due to the growth of debts, which will once have to be paid or written off or, in the extreme case, solved by the depreciation of the currency (I would like to point out at a possible scenario in Japan). In the US, rates are slowly rising, and quantitative releasing is changing into tightening. 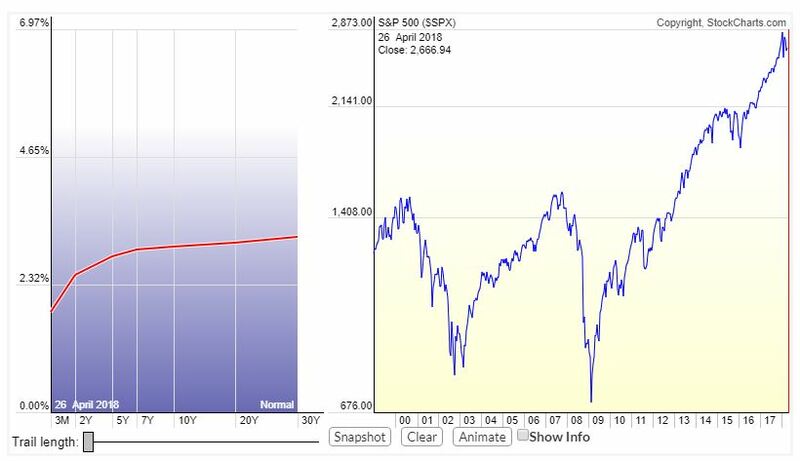 At the moment, we have to stay alerted, but it is no time for a panic yet, it will only come when the market (or GDP) is declining for more than 2 consecutive quarters. I’m looking forward to the recession. I wonder what’s going to be – beautiful or ugly. If ugly and falls of the markets will be significant, I will search for individual companies and find more about their position. For my portfolio, I will choose those that will have enough free cash flow and growth outlook or dominance in the given market based on competitive advantages. If it’s beautiful, I’ll do everything like before – admiring growth with slight corrections. Invest with reason, not with emotions.